This essay was originally published in the Threepenny Review (1994), is featured in Sante’s anthology, Kill All Your Darlings, and appears here with the author’s permission. Now, this is a bit extreme, even if we sometimes think of the entire past, prior to 1968 or so, as an era in which men were never seen without suits and ties. It is difficult to imagine many other 20th-century painters being so insistent on mundane formality; only Mondrian comes readily to mind. Even before Jackson Pollock, the archetype of the modern painter was a spattered and disheveled figure whose principal concession to appearances was an encrusted smock. Magritte’s contrary propensity is not very surprising, even if we know little about him, in part because it is natural to think of his work as having been executed by his alter ego, the bowler-hatted man. 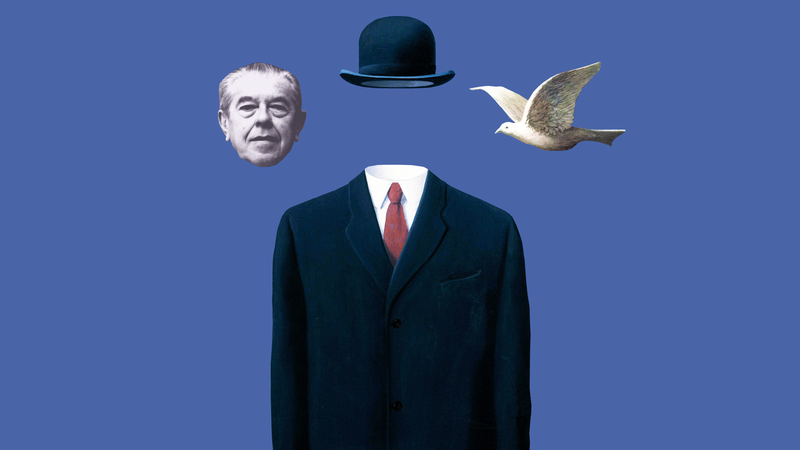 This character, of course, is Magritte’s signature motif occurring over 40 years of his career; seen from the rear, or frontally but with his face obscured, or in multiples. Magritte’s relationship with this figure is ambiguous—he is more often the painter’s homunculus than his self-representation. But Magritte now and then decided to inhabit his trademark, notably during the last years of his life, when he permitted Duane Michals to take numerous photographs of him wearing his bowler. He was also photographed wearing a bowler in 1938, nearly three decades earlier, and in this picture he is next to The Barbarian (1927), his painting of Fantômas either emerging from or melting into a brick wall. He is striking the exact same pose as Fantômas, a chin-on-hand lean that somehow contains a swagger, but while the master criminal sports evening dress, with a topper and a domino mask, the painter wears a sober dark suit, and that hat.